You can get Visual Studio 2013 here: http://www.microsoft.com/visualstudio/eng/2013-downloads. The new refresh() API consists of two methods that each return a Promise object. Asynchronously loads the first page of items into this collection and returns a promise that will be fulfilled when the first page is loaded. Existing results will be refreshed on the first page and subsequent pages unless load() is called again. 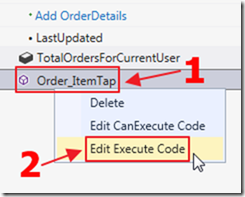 Updates the entity with values from the data source if the entity is not changed. <param name="navigationPropertyNames" type="Array" optional="true">. An array of names of navigation properties to be included. 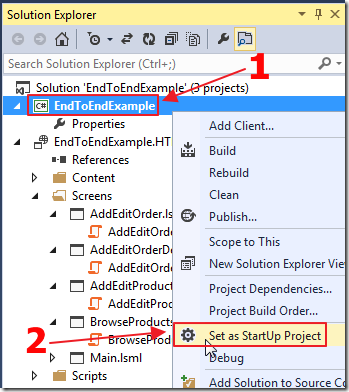 An empty array means no properties will be included. If not specified, all reference properties are included. Let’s say we have a field on the Order entity that is updated in the save pipeline when an associated OrderDetail record is updated. Save the changes. But the time is unchanged on the screen (even though it has been updated in the database). We can instantly have the entity updated if we use the new refresh() method. To do so requires us to implement our own code to open the edit screen (so we have an opportunity to implement the refresh code). We select the Item Tap action for the Orders list. Select Write my own method. We then edit the code for the method we created. When we update the record we will see the date instantly updated without the need to refresh the entire screen. 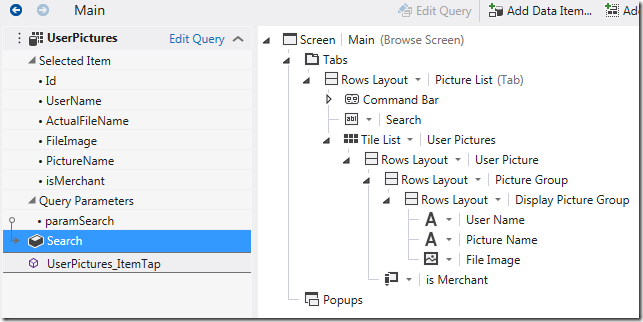 To add new tab first create new user control in your website, go to website in visual studio add new user control where you want as per your defined directory structure. It is good to place new user control under /usercontrols folder in Umbraco website. So the virtual path for newly created user control will be “../../../usercontrols/TestTab.ascx”. The generic parameter T must be type of view which you want to load your user control to appear on. Most commonly used views and their types are discussed below. So if you are inheriting your user control from any of these views you can register for following events. As per the information in the above table you can insert an entry into uCommerce_AdminTab table for new tab. Build your solution and your new tab is ready under the view you have selected. As explained earlier your new tab will be visible for view you have selected, Consider an example where you want to do some functionality Completed Orders (uCommerce >> Orders >> Completed Orders) and if you have followed above steps your new tab will be visible for all remaining sections like New Orders, Requires Attention etc.To hide or show your tab for particular section only, implement ISection interface in your user control and set the Show property as per your requirement. So this will show your custom user control for Completed Orders only. Note: All transactions are real and your PayPal account will be debited $2.00. However, please do not complete a transaction and then reverse the charges, that will cause me quite a hassle. 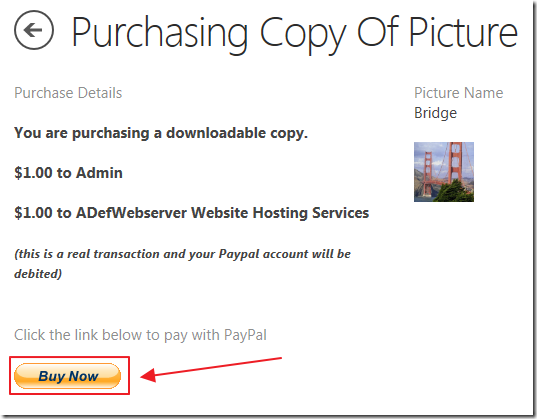 A user can browse the available pictures and purchase a copy by clicking the Buy a Copy button. They are taken to a page where they can click the Buy Now button. They are taken to the PayPal site where they can pay. They can use a credit card (if the merchant account has that option), check, or their PayPal account. After making payment they see a confirmation. They are taken back to the application, to the My Purchases page. 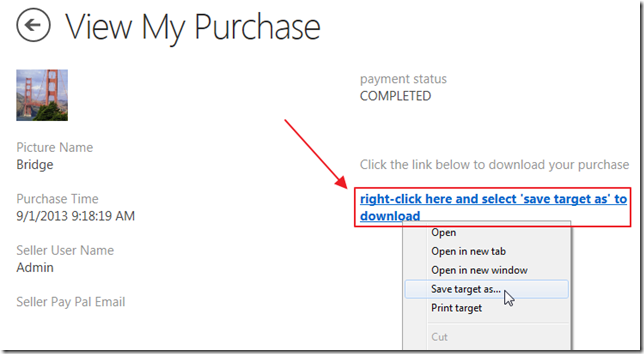 Clicking on a purchase record will take them to a page where they can download the picture, if the payment has cleared. If the payment has not cleared, it will say so and display any error messages. Once payment has cleared this page will allow them to download the picture. 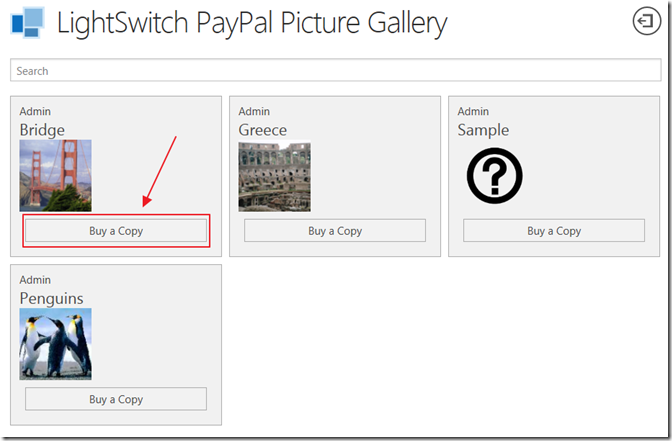 Any user can upload their own pictures, indicate that they are a Merchant, and enter their PayPal account. An administrator can see and diagnose all transactions. 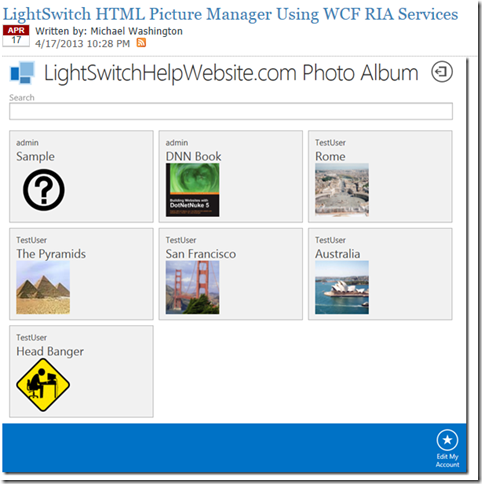 The administrator is defined when the application is published using the Visual Studio LightSwitch publishing wizard. The administrator PayPal account is also configured in the web.config file (this is covered in the next section). 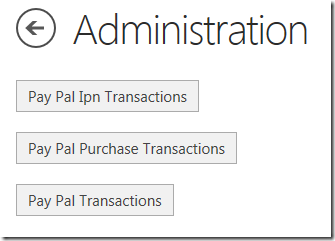 Also note, the PayPal IPN notifications, will only work if the application has been published using the using the Visual Studio LightSwitch publishing wizard and is at a location that can be reached by the PayPal servers. 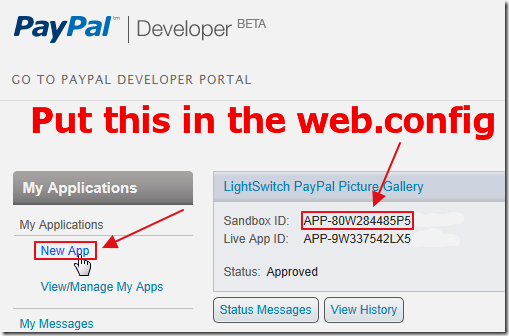 The code in the sample LightSwitch application uses the PayPal Adaptive Payments Classic API: https://developer.paypal.com/webapps/developer/docs/classic/adaptive-payments/gs_AdaptivePayments/. 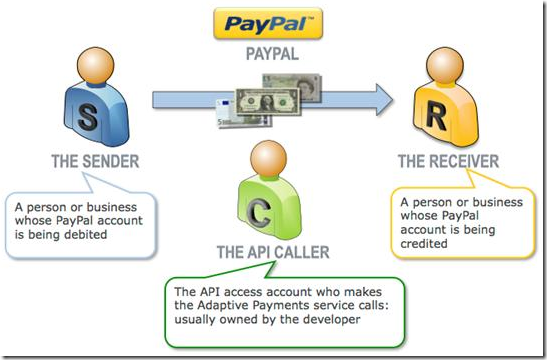 You can get a complete overview of PayPal Adaptive Payments at this link: https://developer.paypal.com/webapps/developer/docs/classic/adaptive-payments/integration-guide/APIntro/. Specifically it uses the Pay API call to make a parallel payment: https://developer.paypal.com/webapps/developer/docs/classic/api/adaptive-payments/Pay_API_Operation/. It also uses the PayPal IPN Classic API to determine when a payment has been completed: https://developer.paypal.com/webapps/developer/docs/classic/products/instant-payment-notification/. This page shows you how to get your API credentials: https://developer.paypal.com/webapps/developer/docs/classic/api/apiCredentials/. You will need to put your values in the web.config of the sample LightSwitch application in the spots marked with a ***. You will also need to go to: https://apps.paypal.com to create a PayPal Classic Application (this is because at the time of this writing the Adaptive Payments API is not available using the newer REST Services API). Create a new application. This will create a Sandbox ID that you will need to also put in the web.config of the sample app. When you create your application, use the settings in the image above. 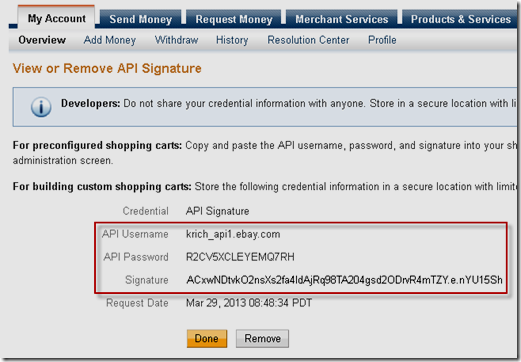 The merchant test account will need to be entered in the web.config of the LightSwitch application. The sample transactions will need three accounts and no two can be the same so you will need to create two additional test accounts (besides the test merchant account that will be created for you) to use to test the application. Open the sample LightSwitch application (available on the downloads page), switch to file view, and open the Web.config, and enter the values in the spaces marked ***. The application should now work. Also note: the PayPal IPN notifications will only work if the application has been published using the using the Visual Studio LightSwitch publishing wizard and is at a location that can be reached by the PayPal servers. When the sample application was created, I used the PayPal Nuget package to install the needed binaries: https://www.nuget.org/packages/PayPalCoreSDK. The PayPal version adds additional tables and screens. The Main screen is the screen customers use to search for and purchase copies of pictures. 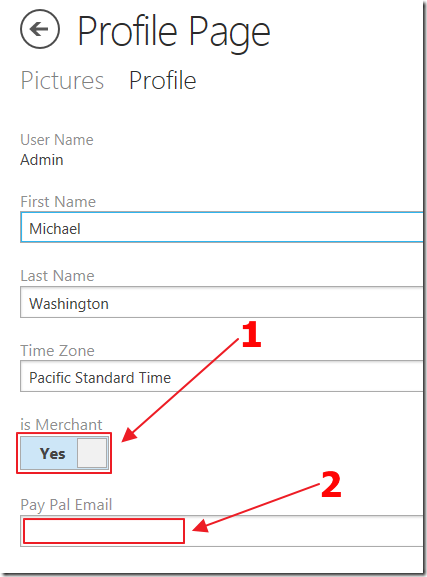 //(Optional) Whether to reverse parallel payments if an error occurs with a payment. //(Optional) A unique ID that you specify to track the payment. //Note: You are responsible for ensuring that the ID is unique. When the user clicks the Buy Now button they are taken to PayPal with the PayKey that has all the details of the transaction. Linq to Sql is used because the call from PayPal is unauthenticated and the LightSwitch application is running under forms authentication. Entity Framework or ADO .Net could have also been used.